Slipped disc in the lumbar spine. Artwork and axial MRI (magnetic resonance imaging) scan through the lumbar (lower back) spine showing a protruding disc (L3-L4 joint). At top left, an artwork of the lumbar spine shows the level at which the MRI scan was obtained. 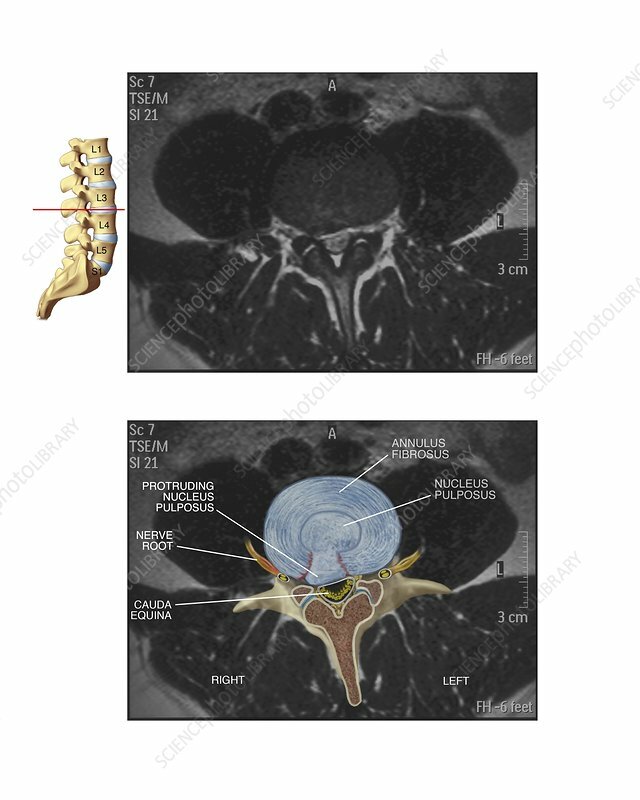 The artwork combined the with the MRI scan (bottom) shows the disc's pulpy interior (nucleus pulposus) protruding through the outer ring (annulus fibrosus), pressing on the cauda equina nerves and the spinal nerve roots. The fibrocartilage discs between each vertebra form spinal joints that bend and flex. Spinal disc herniation can cause pain and in severe cases may require surgery.